We have just concluded out amazing fall 2017 season. And with that we’ve decided to show you all who was the champion of all of our regional tournaments starting with Chicago! Over the next few weeks we’ll highlighting the many winners of the regional tournaments at Bad Axe Throwing and those same people who went on to compete for the World Axe Throwing League’s World Championship! Without further ado, here is one of the Chicago champions for fall 2017! How did you first hear about Bad Axe? How did you fall in love with axe throwing? Tried it once with coworkers and realized how awesome it is! What do you tell people who have never thrown axes before? I tell people they should go try it as soon as possible because they are missing out. If you could throw axes with one person in history who would it be? If it had to be non-fiction than I would say Abe Lincoln because he probably was pretty good at it. If I could choose a fictional character, then I would have to say Paul Bunyan because he is the most iconic lumberjack figure. Work, play basketball, video games, ride my bike, and visit local breweries with my girlfriend. My friends, Freddy and Tanner who joined the axe throwing league with me; Bad Axe Chicago coaches Cody and Sam; Jack, who took me axe throwing for the first time; and my girlfriend Carolyne for supporting my throwing passion. Do you have any social media you like us to link? Or maybe some cool social media axe throwing pictures you may have? There you have him!One of the two Chicago Champions!Make sure to check back over the next few weeks as we feature all the regional champions! 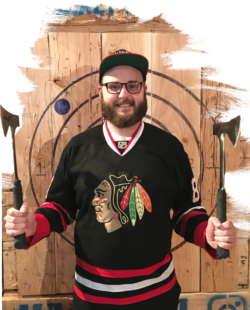 Want to try axe throwing in Chicago? Book an event today – spots fill quickly!